The Southernmost point in the US, the historic homes, the museums, the tours, the restaurants and bars…the hurricanes, the storms, the threats to your windows and doors – fun and tourism aren’t the only things to consider in Key West. If you make Key West, Florida your home, or your vacation home away from home, hurricanes and other kinds of storms and extreme weather can cause damage to your windows and doors, as can break-ins, vandalism, and other security concerns. Don’t wait until it’s too late to protect your home, hotel, store, restaurant or bed and breakfast in Key West – protect your windows and doors with affordable accordion shutters from Empire Construction & Development. Protect your windows and doors from hurricanes. Homes and other buildings in the Florida Keys are vulnerable to hurricane damage. When it comes to protecting your building, don’t settle for re-using plywood. Don’t struggle to put up heavy panels a day before the storm. Make it easy on yourself to prepare for a hurricane in Key West with accordion storm shutters from Empire Construction & Development. Protect your windows and doors from other storms too. Affordable accordion shutters in Key West, Florida protect against storm damage from tropical storms, heavy rain and hail, flying debris, and more. These sturdy aluminum shutters unfold to completely cover each window and door, and can be used whenever you need them. Shutters that are durable and easy to use are a great addition to any commercial or residential building in Key West. Protect your building against heat and sun damage. 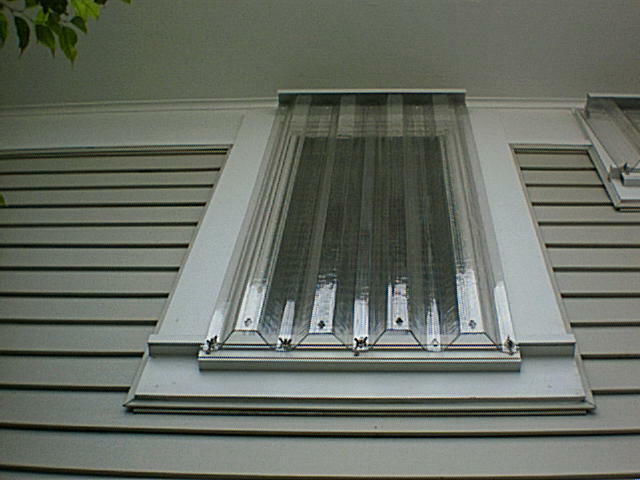 Budget-friendly accordion shutters from Empire Construction & Development can be also be used to protect against heat. Temperatures don’t get too low in the Keys, and your air-conditioning bill can be high year-round. When accordion shutters are closed, they can help to keep a room dark and cool. These shutters can also be used to block direct sunlight from part of your home, office, retail store or other building. Protect your building with the extra security of accordion shutters. If you’re worried about break-ins, theft, and vandalism, secure your windows, storefront, and glass doors with reliable accordion shutters from Empire Construction & Development. Our strong accordion shutters in Key West, Florida make excellent security shutters and can be used to for overnight protection and to protect your home when you’re out of town. 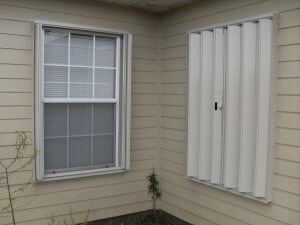 Ordering affordable accordion shutters is easy when you buy your shutters from HurricaneShuttersFlorida.com. To find out the cost of accordion shutters in Key West, Florida, contact us for a price quote. Call 888-474-3555 to speak to a storm shutter expert about measuring windows and doors for accordion shutters, choosing the best storm shutters for your home, and with questions about your accordion hurricane shutter order. Get affordable protection for your windows and doors in Key West, Florida with accordion shutters from Empire Construction & Development. Hurricane season isn’t the only time of year you need to worry about your building’s safety. While seasonal storms can create dangerous conditions for your home or commercial building in Miami, Florida, year-round threats of break-ins, theft, and vandalism can be just as problematic. If you want to secure your home or other building all year, you can install quality rolling security shutters on your windows and doors. Break-ins and theft may be on the rise in areas near you in Miami. You can never know when your home or other building may be targeted for robbery. And once it’s happened, you’ll be left with a mess of broken glass and damaged door or window frames to clean up and replace. Your valuables may be stolen when your home or business is broken into, and home invasions can put you and your family in harm’s way. Though you can’t predict random break-ins, you can help prevent them by covering your windows, glass doors, patio doors, and other openings on your home with sturdy rolling shutters from Empire Construction & Development. Whenever you need to securely cover one or more of your windows or doors, you can use our convenient, quality rolling security shutters. Impact windows in Miami provide some protection against breakage, but allow anyone to see into your home or other building. Security bars on your windows may not be the look you want for your home or business, and can prevent you from being able to open some types of windows. But installing sturdy roll-down storm shutters made by Empire Construction & Development allow you to secure your windows, and let you use your windows normally when your shutters aren’t down. Our quality rolling security shutters are made of durable extruded aluminum and custom built for your needs. If you’re looking for another type of shutter too, we manufacture several types of quality shutters for security purposes and storm protection, including accordion shutters, Bahama shutters, and colonial shutters. Some things just can’t be risked. Don’t question the safety of your home or business – know that it will be protected with rolling security shutters you can count on, made by Empire Construction & Development. 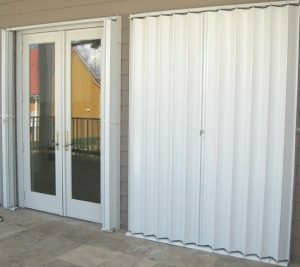 Order your rolling security shutters online at HurricaneShuttersFlorida.com. For a free quote on the cost of rolling security shutters in Miami, contact us today. 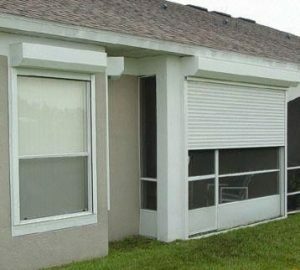 Keep your home or business in Miami, Florida safe every day with roll-down security shutters from Empire Construction & Development. Port Saint Joe is a small town in the Florida Panhandle. Residents are still picking up in the aftermath of Hurricane Michael. In the weeks or months following a hurricane, life is incredibly altered due to people trying to restore their homes and livelihoods. As the rebuilding continues, many in Port Saint Joe, Florida are already preparing for future storms. Nobody wants to think about another hurricane so soon after experiencing the wrath of Hurricane Michael, but the reality of living in the beautiful panhandle region of Florida comes with risks – as in hurricanes and severe storms. That is why many Florida residents are now turning to Empire Construction & Development for durable and affordable hurricane shutters that will not only get them through a hurricane safe and protected, but also because these quality storm shutters will last for many storms to come! Accordion Hurricane Shutters are one of the most popular choices in Port Saint Joe because they are simple to use and because they provide significant storm protection! Empire Construction & Development’s Accordion Hurricane Shutters are made especially for windows and doors of just about any size and they are sold factory direct which makes them very affordable. These shutters are great for storefronts, securing patios, terraces, and balconies, with large expanses all for any house or business in Port Saint Joe, Florida. Accordion Hurricane Shutters lock securely in place and provide maximum protection against storms, high-winds, and forcible entry and they are the best for affordability, protection, and ease-of-use! Due to them being easy to operate, they can be installed in any length because they do not require reinforcement with vertical braces or supports. The benefits of the Accordion Hurricane Shutters are many: When closed, our accordion shutters provide insulation between shutter and window to keep your home warmer in the winter and cooler in the summer, tamper-proof operation, Folds easily for compact storage, extruded aluminum slats effectively block strong winds and direct sunlight, heavy duty locking device reinforces point of closure, specially designed optional key locks for external, unparalleled ease of operation, glides smoothly and locks securely! Accordion Shutters from Empire have been engineered to meet the most stringent wind codes in the country and have been reviewed and accepted by the Miami-Dade County product control division, Florida Building Code, and the International Building Code. Why wait around? Put your mind at ease in knowing your home and family will be protected during hurricane season. Order your storm protection products today from Empire Construction & Development! In addition to quality Accordion Hurricane Shutters, you can also choose from many other storm protection products such as storm panels, Bahama Shutters, Roll Down shutters and more to keep your business or home in Port Saint Joe, FL protected! Call Today: 954-474-3557 or 1-888-474-3555 for a FREE quote in your area or try out their online estimation tool to get a price quote on your storm shutters. Once you see all that Empire Construction & Development has to offer (including unbeatable customer assistance and satisfaction! ), you will understand why everyone in Port Saint Joe, Florida recommends Empire Construction & Development for their security and storm protection needs. Hurricane Michael Was Disastrous! Get Protection Now for The Next Storm! Perry, Florida is a small and charming town where probably everyone knows everyone. Perry, Florida prides itself in being a community that is small but mighty, and whose residents are steadfast and hardworking people. Yet, their lives got a lot harder after Hurricane Michael tore through town devastating many homes and businesses along its path. Flooding caused a boatload of problems and people are really struggling. It’s only been a few weeks since Hurricane Michael ripped through town and the folks in Perry are still picking up the pieces, slowly but surely. Although the 2018 hurricane season is finally coming to an end, preparations for next year’s storm season are already on everybody’s minds. No one in this small town wants to be unprepared for future storms that may come their way. As homes and businesses are being repaired and rebuilt, many residents are already turning to Hurricane Storm Panels from Empire Construction & Development. Investing in Empire Construction & Development Hurricane Control Panels is a smart and affordable option when it comes to hurricane storm protection. Hurricane Storm Panels offer rock-solid durability and easy set-up capabilities. Hurricane Storm Panels are an affordable option when it comes to storm protection for business and home owners. ~Our panels can also be attached directly to the wall without tracks by concrete anchor and stainless-steel screws. ~Our panels have a compact design that allows for easy storage in your garage or shed. Why wait around? Hurricane season arrives every year making storm protection panels a worthy investment. Go get some protection that will see you through a storm year after year. Contact Empire Construction & Development and order your storm panels today. Our storm protection products offer the highest-quality Storm Panels in the industry. Call Today: 954-474-3557 or 1-888-474-3555 for a FREE quote in your area or check out our online estimation tool to get a price quote. Our Stock Size Panels include: 33″, 45″, 58″, 69″, 88″, 104″. Your order can be picked up or we will be happy to ship anywhere in the USA and abroad. Click Here to Order Storm Panels Online. We are very confident that you will be fully satisfied with your Hurricane Storm Panels from Empire Construction & Development! We guarantee it! Posted in Florida, Hurricane Season, Hurricane Shutters, Storm Panels | Comments Off on Hurricane Michael Was Disastrous! Get Protection Now for The Next Storm! The Winds are Changing, and a Storm is Brewing! Are you prepared? Hurricane season is a tricky time and they are not ones who give you treats. Its October! We are in hurricane season! The season ends in November and the peak time is in September but that doesn’t mean we still couldn’t get a storm! October is a month of horror and that’s exactly what a hurricane is! A horror fest. The winds are changing when the weather goes from hot to cold and its fully possible for a storm to brew out far in the Atlantic Ocean, and not by a witch. Well maybe… But that still gives DeFuniak Springs, Florida the opportunity to get hit by one of these hurricanes and you need to prepare for it now. Even if a storm doesn’t come, at least you know you are protected and safe in the future! Empire Construction & Development’s Accordion Hurricane Shutters don’t last for just one storm, they will last you for years and many storms to come! Empire Construction & Development’s Accordion Hurricane Shutters are an amazing fit for windows and doors for any home or business in De Funiak Springs, FL! As well as, securing patios, terraces, storefronts, and balconies, with large expanses. Accordion Hurricane Shutters are quite easy to use and can be installed in any length! All because of its quality of not having a required reinforcement with vertical braces or supports. Production time is guaranteed in 8-10 weeks! So, order as soon as possible to escape any new treat of potential storms! The benefits of the Accordion Hurricane Shutters are: Heavy duty locking device reinforces point of closure, specially designed optional key locks for external, tamper-proof operation, extruded aluminum slats effectively blocks strong winds and direct sunlight, when closed, our accordion shutters provide insulation between shutter and window to keep your home warmer in the winter and cooler in the summer, folds easily for compact storage, unparalleled ease of operation, and glides smoothly and locks securely! Don’t hesitate! The time to prepare is now! That means, Hurricane season is upon us now! Go get some protection that will last you a long time, not just for one storm. Don’t settle for anything other than the best! Empire Construction & Development IS the best! Get the Accordion Hurricane Shutters now and keep your business or home in DeFuniak Springs, Florida safe today! In order to keep the witches away! Call Today: 954-474-3557 or 1-888-474-3555 for a FREE quote in your area or try out their online estimation tool to get a price quote. Once you see all that Empire Construction & Development could provide for your needs, you will understand why everyone in DeFuniak Springs, Florida recommends Empire Construction & Development for all their security and protection desires. You won’t regret your decision with Accordion Hurricane Shutters made by Empire Construction & Development, you will be shocked, to say the least! Posted in Accordion shutters, Florida, Hurricane Season, Hurricane Shutters, Storm Shutters | Comments Off on The Winds are Changing, and a Storm is Brewing! Are you prepared? When a hurricane is approaching your area, you have to do a lot of things to prepare. Securing your windows, doors, and other openings vulnerable to wind and water damage is no doubt one of the many storm prep tasks on your list. Properly securing your windows and doors is one of the most important steps you can take to stay safe and protect your home’s structural integrity during a hurricane. When looking to buy hurricane shutters online in Escambia County, FL, look for the sturdy and reliable shutters from Empire Construction & Development. Accordion storm shutters are one of our most popular storm protection products among homeowners and commercial building owners. Accordion hurricane shutters from Empire Construction & Development are made of heavy-duty extruded aluminum, for maximum-strength storm protection. Accordion storm shutters are installed on each side of an opening and glide along a track to shut securely in the center. These hurricane shutters also have reinforced window and door protection with a tamper-proof locking device. And more to protect your home or commercial building against break-ins and theft. Empire Construction & Development custom builds accordion shutters to each customer order. We manufacture accordion shutters to fit windows, doors, sliding doors, patio areas, storefronts, and more. Accordion shutters can be used on most openings. If your windows are standard sizes, we can make the storm shutters to fit them. If your windows are not standard size, are uniquely shaped, or very large, we can build the shutters you need. Our expert hurricane shutter manufacturing team will work with you to come up with the best shutter solution for your windows, your needs, and your budget. In addition to accordion hurricane shutters, we provide aluminum Rolling shutters, Bahama shutters, Colonial shutters and storm panels to our customers in the most storm-prone areas of the United States, the Caribbean, and beyond. Take a look at our customer testimonials and let us help you protect your home in Escambia County too. Accordion shutters are an affordable way to protect your home, rental property, or other building against storms in the Florida panhandle for years to come. For a free quote on your accordion shutter order, contact us today. Call: 888-474-3555 with any questions for our team, and we will help get you on your way to a safer home during hurricane season. Order custom-built accordion hurricane shutters from Empire Construction & Development for your property in Escambia County. Treasure Island in Pinellas County, Florida lies in a high-risk hurricane zone. Since 1930, 72 hurricanes have been recorded in the Treasure Island, FL. The last hurricane to hit Treasure Island was Claudette in 2009. Impact colonial shutters by Empire Construction and Development Corp., can withstand wind speeds in excess of 140 mph. These shutters are a permanent addition to any property. Hurricane Shutters Florida manufactures colonial shutters from heavy extruded aluminum. Our shutters adhere to the strictest wind codes, including the Florida Building Code’s High Velocity Hurricane Zone Protocols (HVHZ). 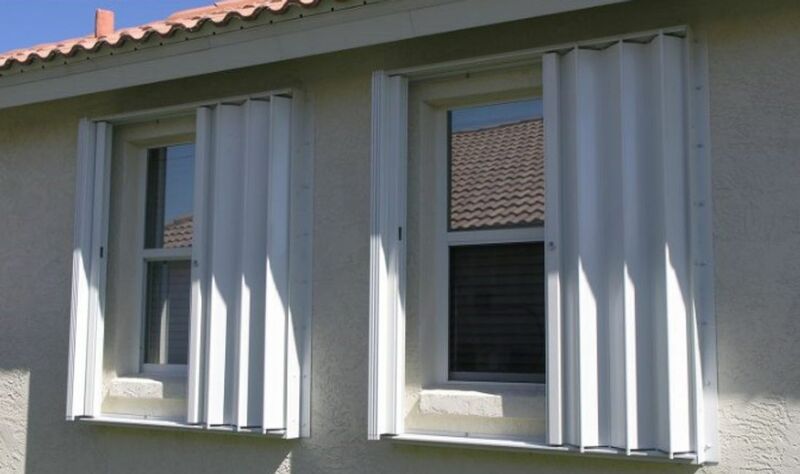 Residents of Miami-Dade and Monroe County can install these shutters. If you wish to protect your Treasure Island homes and properties from wind speeds of up to 140 mph and also have an unobstructed view then high-visibility impact colonial shutters are also an alternative. You can install these instead of regular impact colonial shutters, but do not have a perforated metal backing. Our roster of qualified contractors will ensure that the shutters installed meet design and mounting requirements of the Florida Building Code, International Building Code, and Texas Department of Insurance. Along with Bahama Shutters, colonial shutters add to the architectural appeal of a property. They can easily be closed when a storm approaches. Colonial shutters are easily installed and in 15 minutes, you can set these up for your property. Larger openings can be secured with bi-fold panels. Our hurricane shutters feature a powder coated finish, and you have a choice in colors to complement the décor of your property. Colonial shutters are stacked on either side of the window. For a seamless look, you can choose colonial shutters with no visible screws or mitered edges. Contact us to learn more, and get a free quote. The city of St. Petersburg, Pinellas County, Florida is among the most populous in Florida. The city is renowned for its beaches, museums, a high standard of living, and affordability. St Petersburg lies less than 8 feet above sea level, and every time a storm threatens this barrier island community, people worry about the impending flooding and damage from hurricane winds. You need hurricane protection, not only to protect your property from hurricane damage but also to keep it safe from vandals when you are not at home or are forced to evacuate following a storm warning. Empire Construction and Development Corp., is one the leading purveyors of hurricane shutters in Florida. We stock the best quality hurricane shutters. And because we ship directly from our factory, we sell at rates far lower than what our competitors charge. Our business is well-connected with a network of hurricane shutter contractors that service St. Petersburg and other parts of Florida. Get a free quote. Check out the online quoting tool to compare our rates with others in the business. Contact us. Rolldown hurricane shutters, impact windows, hurricane fabric, accordion shutters, Bahama shutters, and colonial shutters are the shutters you can choose from for your St Petersburg property. Get custom-built shutters for your needs. We can ship products across the nation. Hurricane Shutters Florida manufactures and sells shutters that are approved by the Miami-Dade and Florida Building Code. Do you know how convenient and durable fabric shutters are? These shutters are translucent and very light in weight. These are easy to store and deploy. You can install fabric hurricane shutters by Empire Construction in High Velocity Hurricane Zones. These shutters can withstand pressures of up to 195 PSF, the equivalent of winds at 276 mph. Give your property in St. Petersburg the right kind of hurricane protection. Choose from the variety of shutters we sell. Get in touch, get a free quote, find out if you’re eligible for insurance rebates. Indian Shores in Pinellas County, Florida is a beach front community, and the area is exposed to sea winds. It is also exposed to violent storms and hurricanes. The last major hurricane to hit Indian Shores was Andrea in 2013. It’s almost as if the area is due for a hurricane any time now. Protect your property from gale force winds with our Bahama shutters. These are designed to withstand 140 mph+ winds. Bahama shutters have been a favorite with Key West residents favoring beautiful Bahama shutters for more than 50 years. You, too, can add to the appeal of your property and also give it the necessary hurricane protection with Bahama shutters by Empire Construction and Development Corporation. Add more than just exotic appeal to your property. Add to the property value, and add to the property’s impression in the eyes of onlookers as well as insurers. With these Bahama shutters, manufactured from heavy extruded aluminum and satisfying the requirements of the Florida Building Code, International Building Code, and the Texas Department of Insurance, your house or commercial establishment is totally safe from hurricanes. Only Bahama shutters offer the best mix of style, safety, and shade. If you’re a resident outside Dade, Broward, and Monroe Counties, then these shutters by Hurricane Shutters Florida, which satisfy the strictest wind codes in the country including Florida’s High Velocity Hurricane Zone HVHZ, are a great choice that will also give you additional privacy. 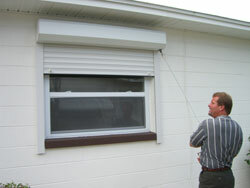 Our Bahama shutters are not only easy to install but also very easy to operate. These permanently mounted shutters are at a 45 degree angle, and can be opened up to 90 degrees. For extra visibility, you may want to consider our High Visibility Bahama shutters that have the same aesthetic appeal as impact shutters. Install our Bahama shutters and keep out the heat, dust, and harsh sunlight. Manipulate the louvers to allow gentle, filtered sunlight to come in. To learn more and get a quote, contact us.